Scanning an image from a Scanner can be really useful and when you are equipped with Windows 8, Windows 7, XP or Windows Vista, the software utility presented here can be a really handy utility to do the scanning. In order to scan an image all you need to do is launch the software and click on the scan button. Yes ofcourse prior to scanning images or documents you must have an appropriate scanner connected to your computer using a USB or other appropriate port. The way in which this Image Scanning software works is by using a functionality known as TWAIN which works with scanners and even webcams. Irrespective of the scanning hardware you have got connected to your computer, the software presented here can be used to quickly scan, store and save the scanned images to jpg, bmp, png or even gif file formats. Scan Images using Scanner, Webcam, etc on Windows 8, Windows 7, XP, Windows Vista, etc. Download the Image Resizer Software, install it on your Windows 8, Windows 7, Windows Vista or other Microsoft Windows version. Install the Image Resizer software on your Windows Computer and finally launch the software using desktop shortcut or programs menu. In case you do have the appropriate Scanner Drivers installed, all you need to do to start the image scanning is click on the Scan Now button and then follow prompts. Depending on the Scanner, you will get the appropriate graphical user interface to continue the scanning. 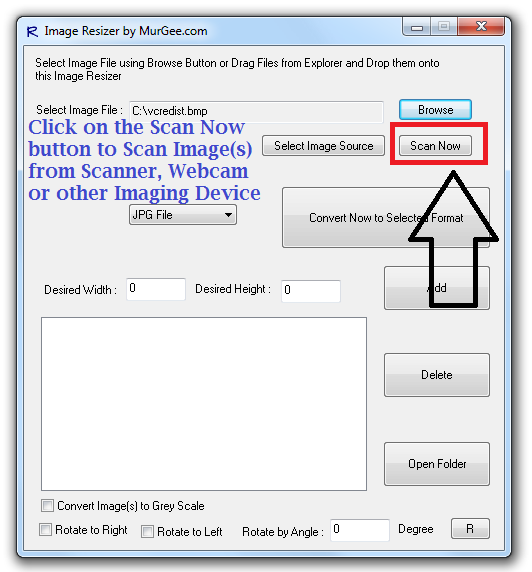 In case you would like to select one of the available scanners, click on the Select Image Source button and select the appropriate Scanner, Webcam, etc. This might work with a Digital Camera however, the software has not been tested yet with a Digital Camera. Yes this Image Scanning software has been tested on Windows 8, Windows 7, and Windows Vista and works well with 32 and 64 bit versions.